Before going on, it should be made clear that one should never make the mistake of thinking a reference range is the same thing as target goals (which change according to an individual’s risk category) for a patient. A reference range is simply the distribution of values that are seen in the folks of a given population. However, patients can make the mistake of comparing their numbers to the reference range (and sadly sometimes even clinicians make this mistake) and therefore think they are at low risk when the opposite is really true. In the first panel, the numbers from our hypothetical patient would not be flagged and a person may think they are at low risk. In the second panel, the numbers from HDL and Triglyceride would be flagged as abnormal. Therefore, it’s more important to go by target goals rather than what a lab supplies as a reference range. 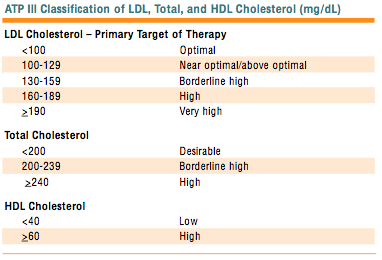 As a side note, the advance lipid panels such as the NMR, VAP, and Ion Mobility advance lipoprotein tests, suggest a reference range for triglycerides at <150 mg/dL. The reference range supplied by the first lab at <250 is obviously way too high to be viewed as a target goal and should never be viewed as such. However, as mentioned in a previous post, even reaching the target goals of LDL cholesterol can be inaccurate to risk. 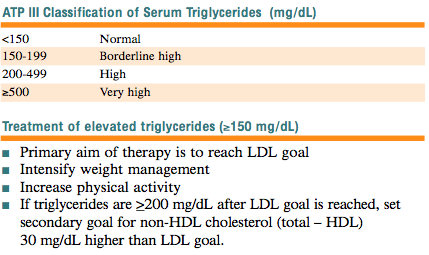 This is even mentioned in the ATP-III where it is suggested to use Non-HDL cholesterol as a target goal if triglycerides are above 200 like our hypothetical patient. However, Non-HDL isn’t always supplied in a lipid panel and many clinicians do not understand its purpose nor do they know how to calculate it even if they wanted to use it. The same dilemma holds true for looking at the TG/HDL ratio as well. In this scenario, our hypothetical patient’s TG/HDL ratio of 6.97 indicates a high likely hood of increased small and total LDL particles which means he’s at risk for atherosclerosis despite being at target for his LDL cholesterol. If we could advance test everyone with LDL particle testing that could solve a lot of confusion but that would be very expensive and it’s not always an appropriate test if the regular lipid panel is concordant. With this in mind and everything else we’ve discussed so far on reference ranges and target goals, it’s not hard to imagine a situation where the interpretation of risk between the patient and the clinician and another clinician is vastly different between each party. TL:DR; Different labs provide different reference ranges which are not the same as target goals. Some of the supplied reference ranges can be vastly outside what would typically be considered a target goal. This can lead to different interpretations of a lipid panel where risk may be judged inaccurately. This entry was posted in Cholesterol, Education and tagged cholesterol, HDL, inaccurate, LDL, Lipid Panel, Lipoproteins, triglycerides. Bookmark the permalink.